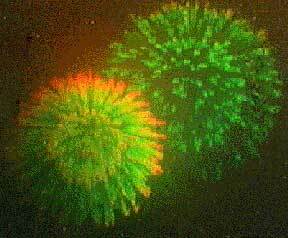 A .jpg image cannot do justice to a hologram, like this three-dimensional image of fireworks, above. Credit. The central question of astrology is really that of consciousness rather than causation. We might ask, are the planets causing events? But the more important question is, what is the factor that is causing the awareness of both the planets and events, which share a relationship? Astrology is the original hologram. A hologram is a 'picture of the whole'. We think of holograms as those amazing three-dimensional photographs made with lasers. But the concept of a hologram can be applied to anything that represents a complete picture, if such is possible. By its nature, astrology depicts the whole; it is a system based on a representation of the cosmos, into which any idea can be integrated, and from which any new idea can be inferred. Astrology is a nonlinear system of thought, perhaps the oldest and most enduring example of nonlinear thought in western culture. In effect, it is a nonlinear model of time. But it is also a model of time with many cycles present, and many ways of advancing time. Astrologers do not just use 'real time', but also use models of time and different images of time to assess the qualities of the past, the present and the future. Often these different methods of examining time provide startlingly similar information, but have the advantage of giving a diversity of viewpoints. Astrology also works 'nonlocally' -- that is, not being bound by location, astrology works all over the world, and, one could theorize, on any world. But within the astrological figure, information is stored many places. An original holographic photographic plate can be broken in two, and each half will contain an image of the whole. A functioning chart works the same way, and will tend to say the same thing many ways, by many techniques. In this way, astrology shares another property with holographic images, which is that fragments or details of a chart can be read as the whole, and study of small elements of the whole reveal much information about the larger picture (also see discussion of fractals, below).So, for example, examination of the Moon's aspects alone, or those of Chiron (for example), can provide a working synopsis of the chart that is accurate in and of itself. As you look at more and more factors, the resolution increases, and different techniques yield different kinds of information, but there always seems to be a great similarity of themes throughout a working chart. This property is why, for example, sunrise charts work when no birth time is available. Astrologers put great emphasis on having the correct birth time, but we all know that a chart cast for sunrise on the day of birth 'works pretty good'. And this is why horary astrology works at all. Horary examines the chart of a question or an event and makes links in the chart's symbols to those of the experience. For example, the chart for the client's arrival in the astrologer's office can say as much as the natal chart. Of all the varieties of astrology, horary (the 'picture of the hour') points to the holographic property more than any other. It is the use of a 'random' sample of space and time, rendered unrandom only by the fact that consciousness has entered: a question was asked of an astrologer at the time of the chart's casting. This apparently random sample tells a much larger story. Even the most basic practice of astrology, one of the earliest exercises in interdisciplinary study, integrates mathematics, geometry (a branch of math), astronomy, physics, philosophy, spirituality, mythology, metaphysics, sexuality, personal psychology, transpersonal psychology, genealogy and a wide variety of other sciences and intellectual arts. Astrology's greatest gift is that it is equipped, along with a well-trained and intuitive practitioner, to integrate the most abstract ideas and forces of the culture into the personal reality, and vice versa. There are no other systems of knowledge that integrate this wide array of ideas and systems of reality-organization into the here-now of human awareness and experience like astrology can. Indeed, most of the -isms, -onomies and -ologies suffer from a gross abstraction that puts them far out of the grasp of a person with ordinary knowledge. But it is the job of astrology to function as a kind of user interface for all the most practical aspects of these other fields, yet also depending on them for its existence, validity and strength. As a hologram, picture of the whole, astrology has long included and made conscious use of numerous properties of the universe before they were known to science, including holography, relativity, quantum, chaos theory and fractal theory, all of which are 20th century developments. Space-Time. One of the great discoveries of the 20th century is that space and time are not separate phenomena. This idea is explored in Einstein's Theory of Special Relativity, experiments for which demonstrated that space and time are relative: that is, related functions or experiences. For example, the faster one travels, the slower time goes, meaning that space and time are inseparable phenomena. That we see them as separate is an illusion; we are really living in a 'space-time continuum', sometimes called 'spacetime'. Astrology predicted the discover of spacetime with its consistent use of space and time as functions integral of one another, since charts are cast for a location in space and a moment and time, and are fully dependent upon both to exist. In astrology, space has never existed without time, and vice versa. Astrology also uses space as time, tracking large and small cycles with the movements of celestial bodies. Matter-Energy Conversion. One of the implications of Relativity is that matter and energy are interchangeable; they are one phenomenon in different forms (much of modern physics has concerned itself with the integration of seemingly varied forces of nature, for example, the integration of the separately discovered forces of magnetism and electricity as the electromagnetic force). Astrology has always viewed 'matter' -- that is, planets -- as energetic forces, recognizing that the patterns of their material movements represent, depict or cause movements of energy or events in the 'physical' world. Whatever the causative element is, the connection between the energy of a seemingly dead or unconscious thing, a planet, and events or experiences in the field of consciousness, is a fact implicit in astrology. Relativity has shown us that matter contains unexpectedly large amounts of energy (E=MC2), which may account for why relatively small planets can be seen to have such tremendous impact. They contain enormous energy, and are in motion. Particle-Wave Conversion. In a similar fashion, astrology has always viewed particles as wave forms and vice versa. For example, the cycle of a planet, viewed over spacetime, is really a wave form (where these wave forms intersect, we have points of contact called aspects). Whether light or a unit of energy called the electron was really a particle or a wave was one of the first questions that quantum physics had to address, and it discovered that they really are both, behaving different ways in different situations. It was a shock to scientists to see a photon behave as a particle in one experiment and as a wave in another (for example, a single thing manifesting in 'two places at once'). But Astrology has always recognized this, treating planets at different times as particles (for example, in the natal chart) and as wave forms (in transit or progression). But they are the same planet. Mandlebrot set image created by DD Chalmers. Full image here. The Mandlebrot set is a mathematical equation composed of real and imaginary numbers developed by the Polish mathmetician bearing its name. The set originated as the bug-like image at the center. Zooming in on any portion of the image will produce a repetition of the original set. 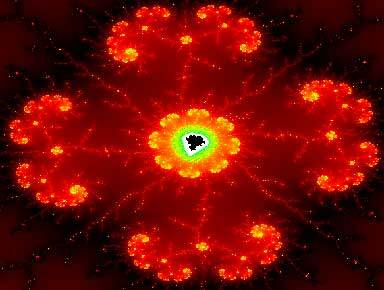 What appears to be chaos is really a highly ordered matthematical pattern, much like the rest of reality. Planetary movements are a complex pattern of nature. Either the movements of the planets are meaningless, or they possess some intelligent order and are thus meaningful in the realm of consciousness. There is no middle ground. A skeptic would need to argue, using these terms, that the patterns are totally chaotic, devoid of order and hence of meaning, and use this as the principle argument against the validity of astrology. Other arguments can be reduced to this basic idea. Fractal geometry, which was born in 1980 with the development of the Mandlebrot Set, analyzes complex forms in nature, such as the branch systems of trees, the flow of rivers, the weather, the branchways of the circulatory system, and others, and uncovers the underlying mathematical principles which reveal at times very precise order to what was previously believed to be a random system of organization or development. In fractal geometry, patterns are seen to repeat themselves in nature, a property also found in mathematically-created fractals like the Mandlebrot Set. Fractal science has documented, for example, that the pattern found in one mile of a shoreline will be a reiteration of patterns found in the much larger coastline, and further, that small segments of natural systems can be studied to predict the outcomes of the larger ones. Astrology uses fractalization in a variety of ways, for example, in the technique known as progressions, in which the 39th year of life is studied by looking at the astrology of the 39th day. This is based on the idea that life is made of patterns, and that the patterns can be understood. Chaos theory views the development of these systems over time. "When we examine the development of a process over a period of time, we speak in terms used in chaos theory," write the authors of Chaos and Fractals: New Frontiers of Science [1992, Springer-Verlag]. "When we are more interested in the structural forms which a chaotic process leaves in its wake, then we use the terminology of fractal geometry, which is really the geometry whose structures are what give order to chaos." An example of the use of chaos theory would be searching for the patterns in a calculation of a number of transits over a long period of time. With the advent of rapid discovery of planets, we will need more elegant methods of reality assimilation in order to be able to interpret their meaning. Chaos and fractal theories can help us decipher the patterns of, for example, the more than 100 newly discovered Plutinos, Cubiwanos and Centaurs, minor planets that have found their way into some astrological charts. What we get in analysis of astrology through the lens of chaos and fractal theories is a patterning of the movement of spacetime, which Einstein showed as really the fourth dimension and inseparable from the other three. Multidimensionality. Because astrology has worked in and with spacetime since its inception, it is a multidimensional art. Astrology takes a more complex view of time, the fourth dimension, than the simple one-strand chronological view taken by society and its train schedules. Astrology works in more sophisticated, nonlinear patterns of time, plotting large numbers of events using sophisticated methods of documentation and analysis. As well, astrology uses fractal patterns of time (in the analysis of progressions and patterns of fragments of the outer-planet orbits, for example), and also studies the course of history, searching for patterns and noting correlations between celestial events and world events and world climate. Hence, the study of astrology gives us a picture of time that is beyond linear time, providing a more accurate, and documentable, picture of the fourth dimension. We take for granted that the other dimensions considered by physicists and the other dimensions considered by mystics are separate or unrelated phenomena. There are numerous astrological phenomena suggesting that it is able to draw from, describe and touch upon other dimensions. The Transpersonal Realm. Astrology relies upon the archetypes of planets and constellations as the basis of one facet of its language (other elements of astrology are more dependent on the language of mathematics, principally, the relationships between objects, called 'aspects'). Carl Jung and others have shown that the archetypes have life in what is known as the transpersonal realm, a field of consciousness that exists outside the life of an individual -- a mind that we all share. Archetypes are experiences, identities, modes of being, mythological figures and other things that show up in many peoples' lives, often at the same time. Astrology views all of life, as depicted in the chart, as such a unified field of consciousness. To do so, it uses space as a model of the transpersonal realm. We all share the same planets in our charts, so astrology is a map of the transpersonal realm in a personal shape and form, based on a very personal sample of spacetime -- the place and time of birth. While physicists search with their computers, space probes and telescopes for a 'theory of everything', astrology may prove to be a theory of everyone. Astrology works in the field of consciousness -- a field that has been remarkably left abandoned by science, which, depending, as it does on linear and empirical methods of thought, is ill-equipped to work in the emotional, often irrational human realm. Synchronicity. Jung and others have documented meaningful acausal coincidences, or relationships between events in the real world and symbols, which convey information of some kind. These are called synchronicities. Synchronicity is a really weird coincidence, or a spontaneous eruption of highly appropriate symbolism. Astrology invokes synchronicity by its very being. We see where chart symbols and life events are related, without needing to know the cause. To say that planets cause events is not exactly wrong, but it is too simple. There seems to be some simultaneous cause of both, or an effect in which charts and experiences reflect certain similarities that make sense to us, if we look. Jung, curious about astrology, did a study which showed that married couples will tend to have a conjunction between their charts involving the sun, the moon and the ascendant. Could it be that all of these properties of the cosmos, and of astrology, point to another, larger reality? Could we be plotting patterns in higher dimensions that will form a picture, like dots in a two-dimensional field can be connected to form an image? And what are the implications for counseling and solving problems, and creating visions, in the field of consciousness and experience, the topographic ocean we call life? Let's keeep asking.